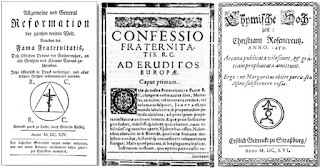 In the Introduction to Rosicrucianism I give a brief synopsis of the three Rosicrucian Manifestos (see Figure 1): the Fama Fraternitatis, the Confessio Fraternitatis, and The Chymical Wedding of Christian Rosenkreutz. In a follow up to this article I will take a closer look at the symbolism found in the Chymical Wedding. 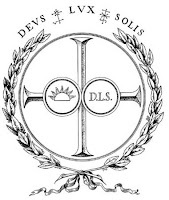 The Fama Fraternitatis, or, A Discovery of the Fraternity of the most laudable Order of the Rosy Cross (hereafter referred to as "The Fama") was first published in 1614 in the Hesse-Kassel region of what is now Germany. The Fama starts off with a statement concerning the loss of wisdom which paves the way for the release of this treatise, as they call it, and the legend of Christian Rosenkreutz and the return of wisdom to Europe. To understand the opening statement, you must understand the geopolitics of the time. When the Fama was published, it had been nearly a century since the Reformation had begun – marked by the publication of the 95 Theses by Martin Luther. Western Europe was split between Catholicism and Protestantism. 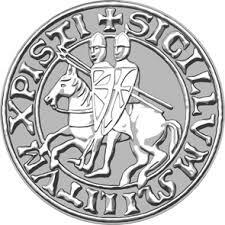 Germany was not a single state as it is today, but was composed of several principalities and smaller states ruled by Princes who were fighting amongst each other as some were Catholic and some Protestant. The publication of the Manifestos happened in the years preceding the Thirty Years’ War; one of the longest and most destructive conflicts in human history. Germany wouldn’t unify until after the Franco-Prussian War in the late 19th century. The Fama begins the story of Christian Rosenkreutz, but only mentions a Brother C.R. or C.R.C. It is not until the Chymical Wedding that the legendary founder is known as Christian Rosenkreutz. It is believed that Rosenkreutz was born in 1378 somewhere in Germany. At a young age, he was orphaned and raised in a cloister also known as a monastery. The monks taught him to learn several languages and at age 16 he decided he wanted to travel to the Holy Land. 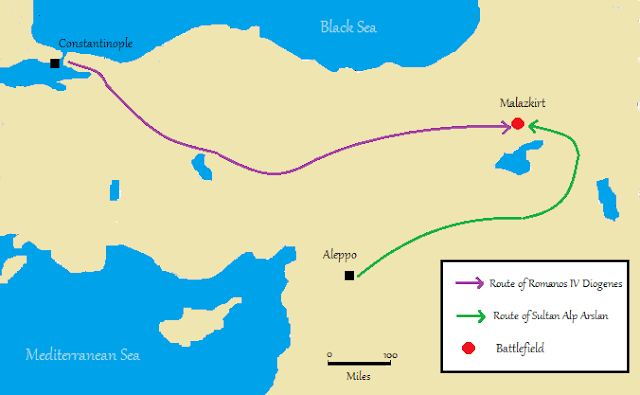 He and another companion traveled to Cyprus when the companion is said to have died. Rosenkreutz traveled to Damascus and received instruction from the learned sages of the time. Some argue that his travels took him to Damcar at the bottom of the Arabian Peninsula (modern-day Yemen) rather than Damascus (see Figure 2). He learned physics and mathematics and translated the Book M. After 3-years, he traveled to Egypt and then to Fez (Morocco). He expanded his knowledge and desired to return to Europe to teach all he had learned. 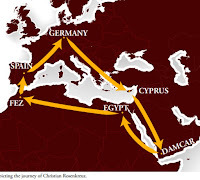 He crossed the Mediterranean to Spain and was met with scorn when he attempted to spread the knowledge he had gained in his travels. He returned to Germany and spent 5-years studying at which time he decided to establish a brotherhood dedicated to the preservation of knowledge. 1. That none of them should profess any other thing than to cure the sick, and that gratis. 2. None of the posterity should be constrained to wear one kind of habit, but to follow the custom of the country. 3. Every year, upon the day C., they would meet together at the house Santi Spiritus, or write the cause of their absence. 4. Every Brother should seek a worthy person to succeed him after his death. 5. The word CR should be their seal, mark, and character. 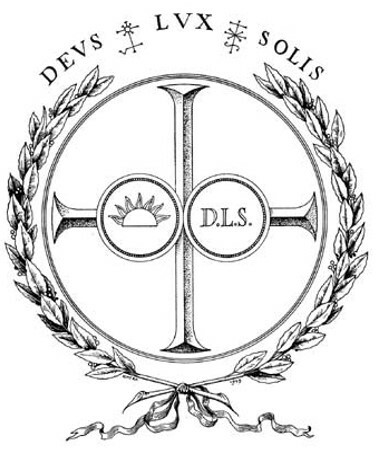 The brothers then parted ways with only 2 of the brethren staying with Brother C.R.C. (Rosenkreutz). Christian Rosenkreutz is believed to have died in 1484, at the age of 106. None but the two other brothers knew where he was buried. The tomb of Christian Rosenkreutz (see Figure 3) is believed to have been found in 1604. The tomb had 7 sides: Each of the 7 walls were divided into 10 squares carved with figures and sentences. Each wall had a door to a compartment with treasures of knowledge (books and devices) The ceiling was composed of 7 triangles angled upward to some kind of artificial light emanating from the center. The floor was also divided into 7 triangles with a circular altar in the center. 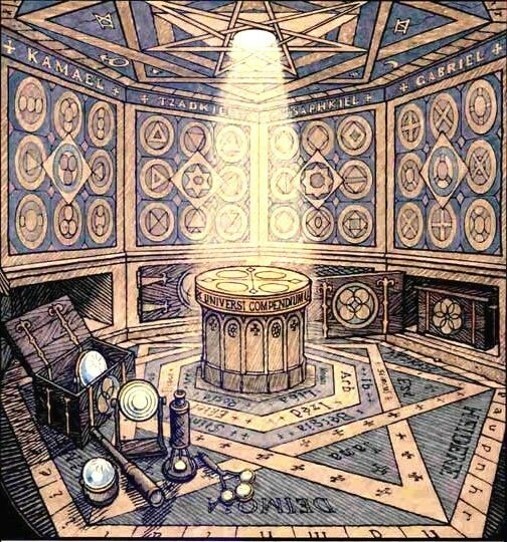 The altar had four circles within it each containing a figure. On the circle surrounding each figure stated four Latin inscriptions. The body of Brother C.R. was found in a sarcophagus beneath the altar. When his body was discovered, it was said to be whole and unconsumed. Found with his body was a parchment known as “Book I” which they considered the greatest treasure next to the Holy Bible. They replaced the altar, sealed the tomb, and put their seals on the door into the vault. The Fama ends with a recognition of the Christian nature of the order as well as the Holy Roman Empire as the sovereign power of the realm. The author proclaims that the Brotherhood's philosophy is the same as the philosophy of Adam, Moses, and Solomon. And lastly, the author requests that the learned of Europe to contact the Brotherhood. 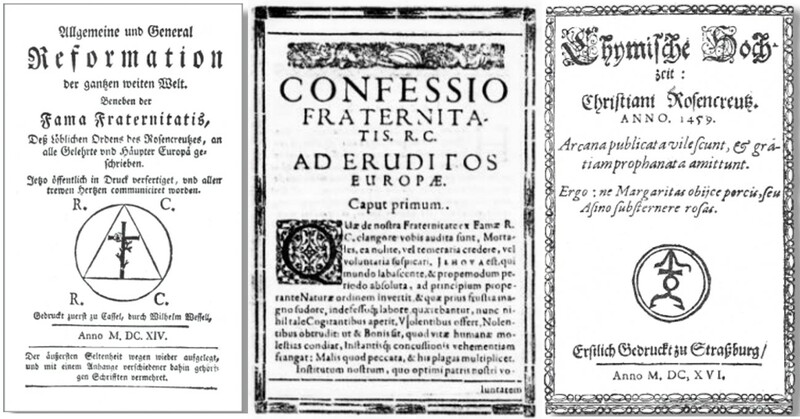 The Confessio Fraternitatis, or The Confession of the Laudable Fraternity of the Most Honorable Order of the Rosy Cross, Written to All the Learned of Europe (hereafter referred to as "The Confessio"). This publication was a follow up to the Fama Fraternitatis and was published in 1615 in Wilhelm Wessel in the Hesse-Kassel region of Germany, like the Fama. It keeps in line with the Fama, in that the Germanic states and Europe, in general, are in a state of decay and the call to the European intellectual world to contact the authors is repeated. This document has an anti-Catholic and anti-Muslim voice to it. I say this as the document states: “We do condemn the East and West (the Pope and Mohamet) blasphemers against our Lord Jesus Christ.” For its audience, it seems to be speaking to the Holy Roman Emperor and the Protestant Princes. It is composed of 14 chapters and 37 rationales for the Brotherhood, defending it from the accusations levied against the Brotherhood since the Fama was published. 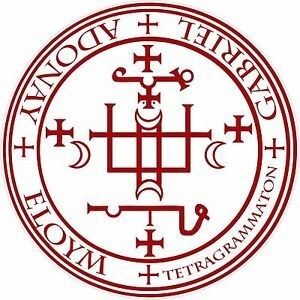 It also justifies its actions and reassuring the learned of Europe that the unworthy will never be able to get to the knowledge, the treasure, of the fraternity; such unworthy are exampled when the author(s) condemn "false alchemists." In one section it does speak that the fraternity is divided into degrees, but does not go into any detail as to the nature of these degrees. 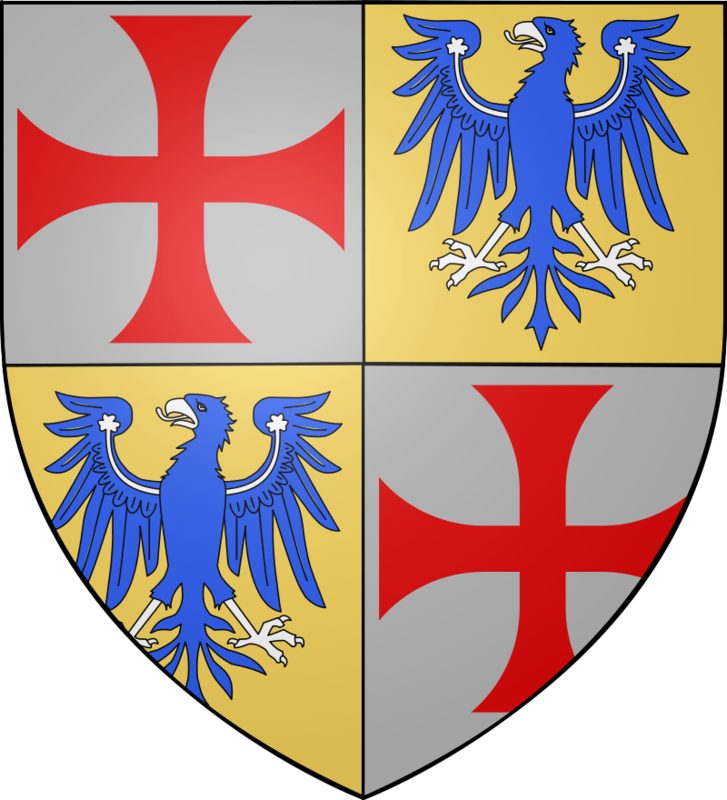 It is also within the Confessio that the dates of birth and death of Brother C.R.C. are spoken of. The Confessio reiterates the Christian nature of the brotherhood, but it seems more to esoteric Christianity rather than exoteric Christianity. The author is still unknown, but many like Francis Bacon or Johann Valentin Andreae have been believed to be the author. 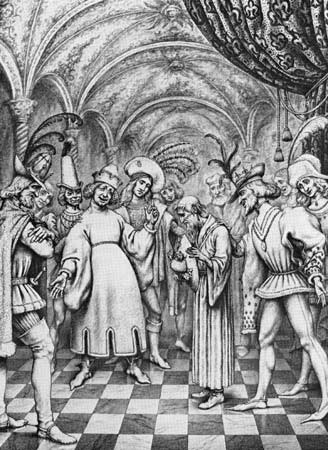 The Chymical Wedding of Christian Rosenkreutz, or Chymische Hochzeit Christiani Rosenkreutz anno 1459 (hereafter referred to as "The Chymical Wedding"), was published in 1616 in Strasbourg, Germany. 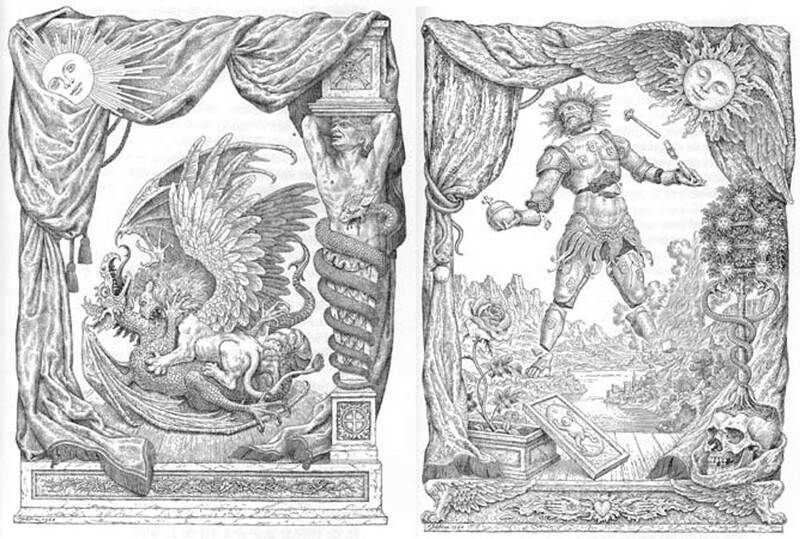 Like the previous two, the author is unknown but is attributed to Johann Valentin Andreae. 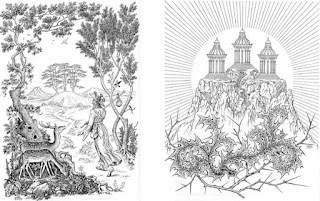 The Chymical Wedding of Christian Rosenkreutz is an allegorical story of self-improvement through initiatic rituals that our legendary founder goes through in order to assist the Chymical Wedding of a king and the queen and is broken up into seven chapters or days. On a day near Easter in 1459, Christian Rosenkreutz, now 81-years of age, is visited by an angel who is described as a “wonderfully beautiful female figure, dressed all in blue, spangled liked the heavens with golden stars” (see Figure 4). The angel presented Rosenkreutz with a scroll and departed. The scroll had a seal on it fixed with a cross and the words “In Hoc Signo Vinces.” The scroll was an invitation to a royal wedding. Christian Rosenkreutz recalls that he had a vision about this wedding 7-years prior, but he is worried that he was not worthy of such an invitation because he felt he was still bound by materialistic desires. He prays then went to bed. He dreams that he, along with a multitude of men, was stuck in a dark dungeon crawling over each other (see Figure 5). He is saved when a group of nine Lords dropped a rope down into the dungeon. Very few were drawn up because their fellow captives would fight over the rope and if they could not get a grasp they would pull down those who had grabbed hold. Upon the sixth drop, Rosenkreutz was able to be pulled out of the dungeon. This represents the redemption that helps him shed his material desires and helped him with his inner conflict of going to the wedding. An old crone that was with the nine Lords presents each of the saved with a gold coin stamped the rising sun on one side and on the other was three letters: D.L.S; some refer to this as a travel penny (see FIgure 6). With an admonishment from the elderly woman, the trumpets began to play which awoke Rosenkreutz from his slumber. He took the dream to mean that God found him worthy to set forth on the adventure to the wedding. After dressing, packing supplies, and prayer, Rosenkreutz set off on his adventure. The first short, dangerous, scarcely possible to pass, and leads to rocky places (believed to be an attack on the Catholic Church). The second is a circuitous route, long but easy. The third is the royal way and a joyful journey but is allowed only for a few select travelers. The fourth way cannot be taken by man, but only the truly incorruptible. While deciding on which path to take, he decided to eat. He tried to feed a dove, but a raven fought with it over the bread. He chased after both and inadvertently took one of the four paths, but had left his supplies behind. It is believed that he traveled upon the second path. 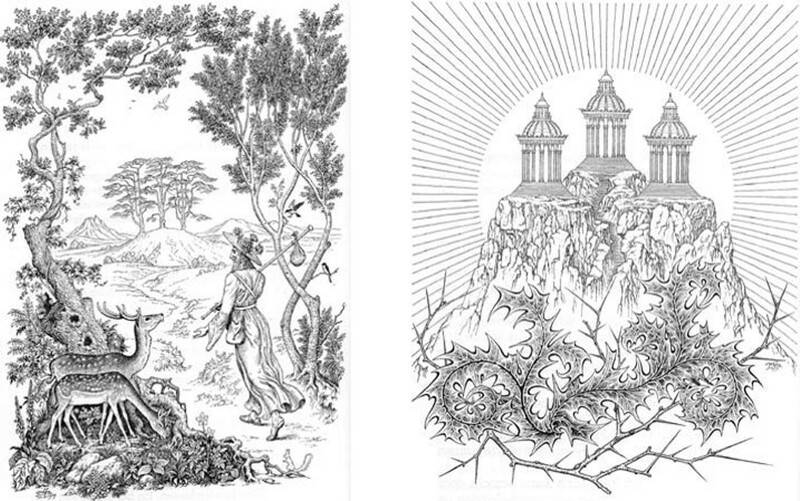 Eventually, he came to three temples and three gates (see Figure 8). At each gate, he was questioned by the porter (or guard). Each porter gave him a token in return for the few possessions he still had on him. These tokens would show him to be a guest at the royal wedding. 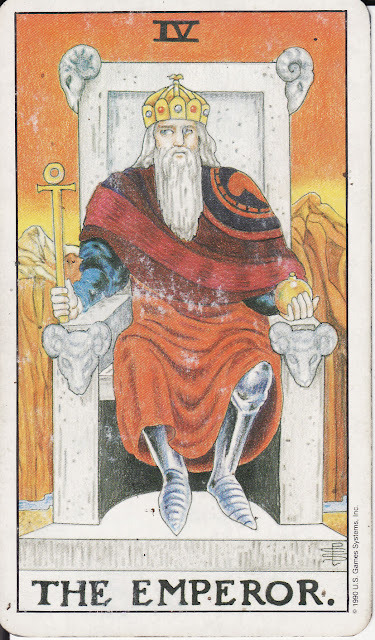 With these gates, he is shown to be prepared for initiation. He is taken to a Hall for Judgment along with every type of humanity there. He is mocked for his plain dress and modesty (see Figure 9). When requested to be seated, the rest took the better seats leaving Rosenkreutz to a small bench in the corner. They were fed a meal by invisible attendants. Several of the guests become intoxicated and begin to brag of their supposed extraordinary abilities. The Virgin then enters the hall telling the guests they will be judged to determine who is worthy enough to stay and assist the wedding. Anyone who felt worthy was to go find a bedchamber while those who felt they were unworthy were to stay the night in the hall. Only 9 stayed in the hall, to include Rosenkreutz. They were bound by ropes and left in darkness and discomfort. Rosenkreutz fell asleep and had a dream where he stood upon a high mountain watching men being hung by the neck over a valley. An ancient man flies around cutting their ropes with his scythe and they fall to the earth. Those lower fell gently while those who were higher did not. 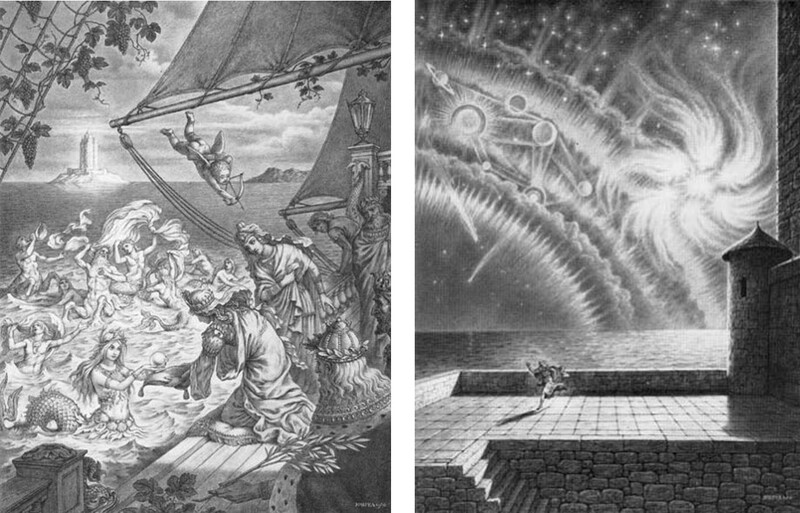 Rosenkreutz recounts this dream with the companion he was bound to and they finish the night in harmonious discourse. The next morning the Virgin entered the hall and had the guests unbound (see Figure 10). A large set of golden scales were set in the middle of the hall. Next to it was set a table with seven weights. All, but one of the emperors were found wanting and unworthy. Only the last one was steadfast. This was true for the other lords, knights, learned, and other nobility. Those who passed the weighing were given a red velvet gown and seated upon the steps of the Virgin’s throne. Those who had stayed the night in the hall were then weighed. Only Rosenkreutz and his companion withstood the test. With Rosenkreutz, he withstood all of the seven weights and even additional full armored knights added by order of the Virgin. Because he was the “weightiest” he was allowed to release one of the captives, those who did not pass the weighing. He chose the first emperor who allowed to sit with the worthy. A lunch was held where the worthy sat a high table while the unworthy were sat at a lower table. At the higher table, the attendants were now visible while those at the lower table were still unable to see the attendants. 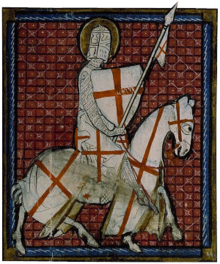 The worthy were now known as Knights of the Golden Fleece. They then were taken to a garden where the judgment of the unworthy was announced. Those who weighed only a little were allowed to redeem themselves and depart with dignity. At the door they took a 'Draught of Forgetfulness.' Some were stripped naked and sent out. Some were scourged. Those who were impostors and frauds lost their lives. After performing ablutions in a fountain, they were taken back to a castle and shown some of its treasures before dinner. During dinner, the Virgin propounded riddles to the guests to which none could answer. The seven weights were then taken back to storage in seven chapels. The worthy guests were then guided to their own bedchambers. Rosenkreutz oversleeps but finds the guests by the fountain in the garden. 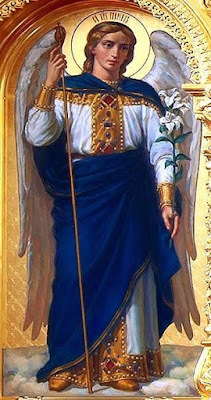 After more ablutions and drinking from the fountain, they were given new clothing: garments of cloth-of-gold set out with flowers, and a new insignia of the Golden Fleece. The Virgin led them to the Royal Hall by a staircase of 365-steps where the King and Queen sat in all of their glory. The Virgin presented them and they were welcomed by Atlas, the Court Astrologer. The King and Queen were seated under a great arch on the Western end of the hall. 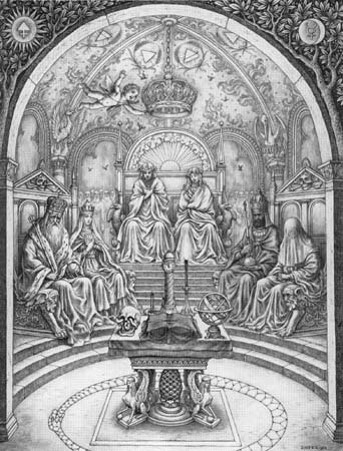 With the King and Queen also sat an ancient king with a young queen and a middle-aged black king with an old matron. 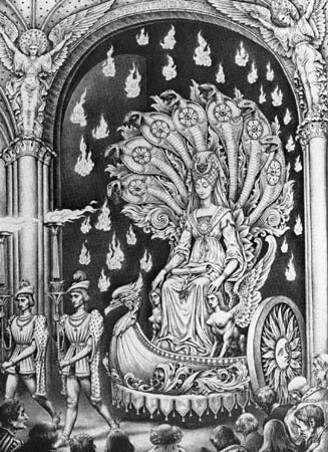 Before the King and Queen sat an altar on which sat: a book of black velvet, a lit candle, a celestial globe, a clock, a skull with a snake winding in and out of its eyes, and a crystal fountain of red liquid (see Figure 11). The guests were taken to their own hall where they would watch a play. The play speaks of an infant queen who keeps falling prey to the Moors. 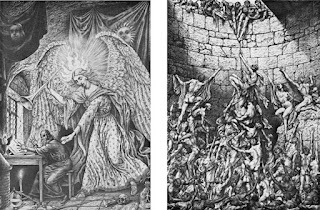 The queen was rescued by a king she had been betrothed to in her youth and he restored her to her kingdom and throne (see FIgure 12). After they play, a feast was held in the Royal Hall where the guests were arrayed in snow-white glittering garments. At the request of the King, the guests wrote their names in the black velvet book. Then they all drank from a cup with the red liquid which is said to be the Draught of Silence. They were then dressed in black garments and the room was then covered in black drapery and six black coffins were placed in the center. The three kings and three queens were then blindfolded, and were one-by-one beheaded, solemnly and reverently. The executioner was then beheaded and placed in a shrine. After a reassurance from the Virgin, they were taken back to their bedchambers. 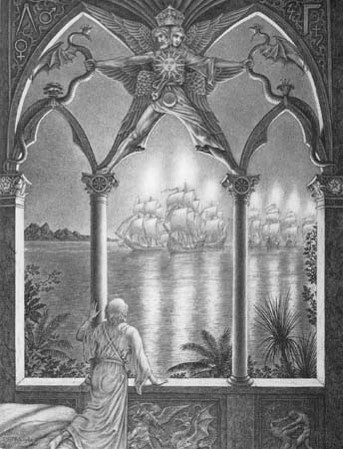 That night, Rosenkreutz, looking out the window at the lake, saw seven ships, each with a flame hovering over them representing each of those died that night. The Virgin and her attendants then took a coffin and the shrine to each of the ships (see Figure 13). He returned to the Royal Hall but was ushered to the garden by the Virgin. 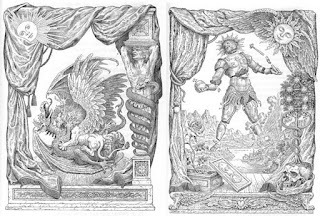 In the garden, there were now six sepulchers under a roof supported by seven columns, above which floated a flag with a phoenix on it. They then took part in what Rosenkreutz knew was a fake royal funeral. The guests then went with the Virgin to the island Tower of Olympus where they would prepare to bring the royal persons back to life. At the shore, there were anchored the seven ships, five of which were flying planetary signs, one a globe, and one a pyramid for their banners. Rosenkreutz went on the third ship with the Virgin. On their voyage to the island, mythical creatures and deities met with them; mermaids gave a gift of pearls for the wedding (see Figure 14). The island tower was massive and was guarded by an ancient warden. The coffins were moved inside and the guests went to bed. Rosenkreutz went to the top of the tower to look out at the sea, but a storm came upon the tower that chased him back inside (see Figure 15). In the morning, the Warden entered the room with attendants carrying ladders, ropes, and large wings. He told them that they each must carry one of those three items the entire day. Rosenkreutz had to carry around a large, heavy ladder. The warden then locked them into the room, but after a short time, a circular portal opened in the ceiling. The Virgin invited them up. The ones with wings flew up easily. The ones with ladders went up next with much ease, but the ones with ropes had much difficulty climbing up. In this chamber, Rosenkreutz watched an alchemical ritual led by the Virgin causing the bodies of the slain kings and queens to dissolve. They then ascended to another chamber in a like manner as before. In this third chamber, the walls were windows and mirrors so that everywhere was reflected the sun. The reflections heated a golden globe hanging from the ceiling. The globe was then cooled and cut open where a white egg was found before taken by the Virgin. They then ascended again to a fourth chamber. In the fourth chamber, they found the egg in a square vessel with silver sand and watched as the bird freed itself from it. 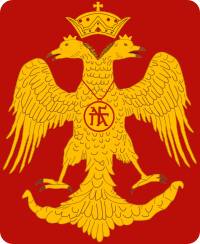 They then fed the bird with the blood of the kings and queens which caused him to grow. In his growth, he went from black feathers to white feathers to multicolored feathers. The bird departed and the guests advanced to a fifth chamber as they did previously. Here they bathed the bird where it lost its feathers and was painted blue before taking off with the Virgin. 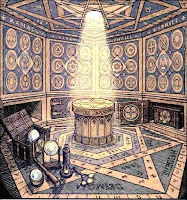 They ascended into a sixth chamber where they found an altar with the six devices they had seen in the Royal Hall. The bird drank the red liquid and pecked at the snake. All the while the globe rotated and each time it reached a conjunction the clock chimed. The bird then laid his neck on the black book where he was beheaded and his remains burnt to ash. 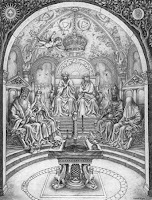 The Virgin then accused four Rosenkreutz and three others, as being “lazy and sluggish laborers.” Once out of the sixth chamber, they were elevated to the eighth chamber where they came to an old man who said they four were actually the worthy ones chosen by the Virgin. The Virgin entered in with the ashes and with the help of the four turned the ashes into a dough then molded two figures out of it. Rosenkreutz and his companions saw a crevice in the floor where they espied the other guests working a furnace below them. They worked happily thinking they were the preferred ones over the four. Rosenkreutz and his companions then broke open the molds and found two angelic babes in them: one male and one female. The blood collected from the bird was fed to the babes which caused them to grow. 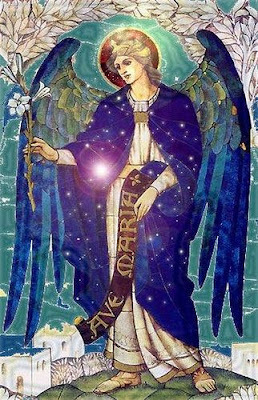 The Virgin and Warden performed a ritual that caused a flame to come down from the Heavens and entered the two. Cupid then entered the chamber and woke them. The King and Queen awoke with amazement as they thought they had slept from the time of their beheading. The four then rejoined their companions for dinner and had to pretend they were in a lamentable condition. After dinner, they retired to their own bedchambers where Rosenkreutz went to sleep immediately from his labors. On the seventh and final morning, they met in the lowest vault of the tower and were dressed in yellow habits. Each guest was presented with a gold medal, bearing on one side the words, "Art is the priestess of Nature," and on the other, "Nature is the daughter of Time". They sailed back to the castle in 12-ships representing each of the signs of the zodiac where they found 500 ships anchored in the lake. Old Atlas sailed out to them and welcomed them on behalf of the King and Queen. Once ashore, Rosenkreutz, dressed in white with a red cross, rode with the King to the three gates he had come to on Day 2. Between the first and second gate, the King informed Rosenkreutz that the guardian had been a famous astrologer who had transgressed against Venus and as a punishment had to guard the first gate, but would be freed when another had transgressed. Rosenkreutz feared it was him as he had seen Venus naked in her chamber. During dinner, the King and Queen played a game similar to chess but using vices and virtues as pieces. I. To ascribe our Order only to God and His handmaid, Nature. II. To abominate all whoredom, and not defile our Order with such vices. III. To use our talents to assist all that they have need of them. IV. Not to strive for worldly pride and high authority. V. Not to wish to live longer than God would have of us. 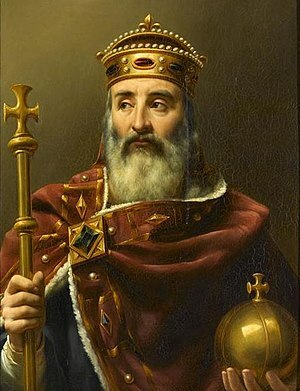 The king then invited each guest to visit with him in private to request a boon. At Rosenkreutz's turn, he confessed what he had done on Day 5 and requested that the Guardian be released from his punishment. The king grieved at this mischance, and though he wished to could not transgress this ancient usage. Rosenkreutz must become the new Guardian. The ring of the guardian was placed on Rosenkreutz’s finger. The king embraced him and bid him farewell. Rosenkreutz was led to some lodging by Atlas and the Warden of the Tower. The Chemical Marriage then abruptly ends, leaving the impression that Rosenkreutz was to assume his duties as the new guardian on the following morning. This was but a very brief introduction to this philosophical and often misunderstood belief system. We may never really know if Christian Rosenkreutz was real or allegorical, nor is really relevant as he did not invent the doctrines he followed, but cultivated and perpetuated those things which he discovered in his legendary travels. 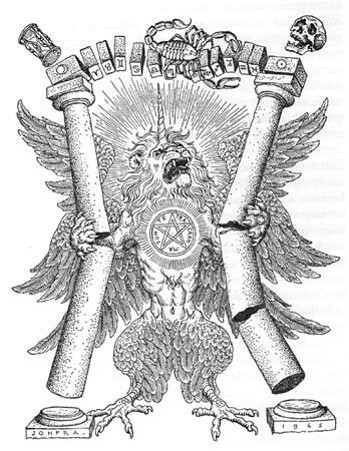 These documents which immortalized this figure came about during the Age of Enlightenment and had a profound effect on many historical figures such as Francis Bacon and John Dee.